Signs of aging such as fine lines, wrinkles, skin texture, and discoloration are often difficult to treat. Thinning of the epidermal layer, reduction in cell regeneration, flattening of the dermoepidermal junction with decreased production of collagen, increased size of pores with decrease in normal skin moisture are common with aging. There is also hollowing and wrinkling of facial areas due to diminished skin elasticity, loss and displacement of the underlying fatty tissue. As the fat pads in your face shift/diminish, atrophy, and thinning volume, your skin may appear less plump and drawn. This treatment has also been effective on not only acne scarring, but scars on other parts of the body as well. This has so far proven to be a very good method to remodel the skin and reverse photodamage. Elastin and collagen are the primary structural proteins in the dermis. Collagen and elastin are abundant in skin at an early age ensuring renewal and regeneration. With a demand for nonsurgical procedures, minimal or no down time, the Secret RF is a very novel fractional radio frequency system with microneedling to stimulate and remodel collagen; addressing a lot of the common signs of aging discussed above (fine lines, wrinkles, and skin texture). This treatment can be performed on all skin types, especially those who want to revitalize and refresh the skin’s appearance. 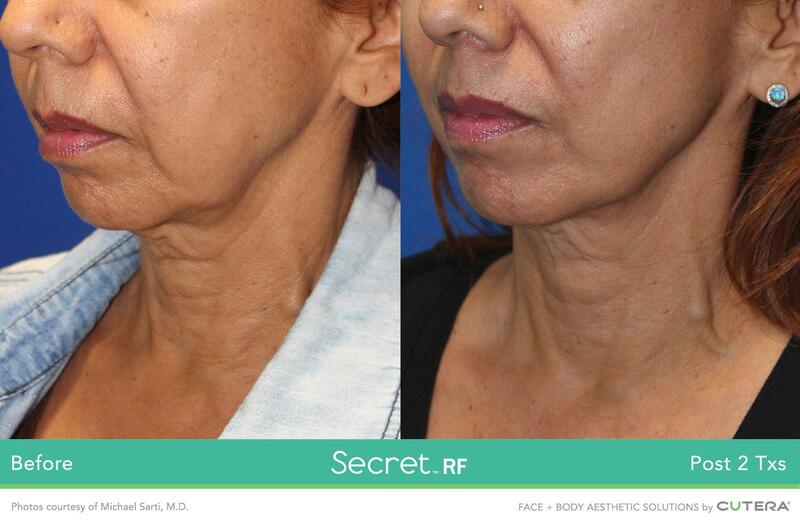 The Secret RF induces dermal remodeling by adjusting the depth of the energy delivered; the Secret RF can be tailored to target the patient’s skin concern(s) (i.e., fine lines, wrinkles, acne scarring, and aging). There are two hand pieces with a 64 pin head which covers a wide area and is used for treatments on the body, giving better results. The 25 pin head is often used for areas like the face, neck, and hands. 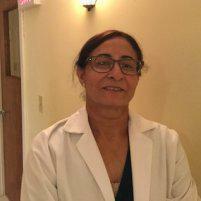 Multiple treatments are necessary and done at one month intervals. Keep in mind the number of treatments needed vary on the issue being targeted and or the amount and depth of scarring. 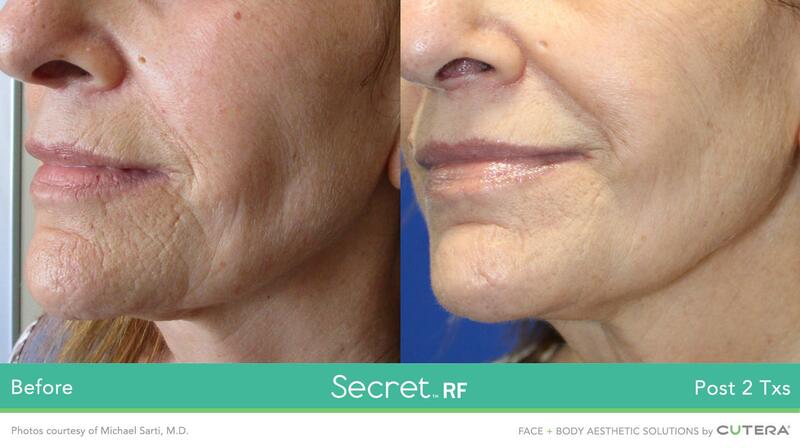 If necessary, the Secret RF can be combined with a laser treatment for further skin revitalization. Some patients may be red for a few days, with darker skin type patients have less downtime.